There are fears that children who have suffered the loss of a parent will bear the brunt of changes to bereavement benefits. As of April 6, 2017 a benefit which was paid to widowed parents in Northern Ireland for a maximum of 19 years has been replaced with one limited to just 19 months. The change could leave newly bereaved families worse off by tens of thousands of pounds. Mother-of-four Siobhan McLaughlin from Co Antrim was left struggling after she was turned down for bereavement benefits following the death of her partner John Adam from cancer. “It was hard, there’s no denying it. It still is hard,” she said. Three benefits – Widowed Parent’s Allowance, Bereavement Payment and Bereavement Allowance - have all been scrapped for new claimants in favour of the new Bereavement Support Payment. However, people who are under the old bereavement benefit system will not be affected by the changes. Bereavement Payment provided a £2,000 lump sum in the event of the death of a wide/husband/civil partner. Bereavement Allowance allowed widows/widowers aged 45 or over received £34.11- £113.70 a week, depending on their age, for one year. Widowed Parent’s Allowance entitled a husband/wife/civil partner in receipt of child benefit to up to £113.70 a week up to the age of 19. Under the new system everyone will receive Bereavement Support Payment if their spouse or civil partner died on or after 6 April 2017, are under State Pension age and their spouse or civil partner had paid a minimum of 25 Class 1 or Class 2 National Insurance contributions in any single tax year during their working life. Surviving spouses or civil partners could be entitled to an initial payment of £2,500 and up to 18 monthly payments of £100. Widowed parents could receive an initial lump sum of £3,500 followed by £350 a month for 18 months. Claimants receiving Widowed Parent's Allowance under the old system could receive £112,000 from that benefit over the lifetime of the child compared to a maximum of £9,800 under the new system through the Bereavement Support Payment. Data from the Department for Communities, which is responsible for benefit payments, indicates that grieving families will be worse off following the reforms. At October 2017 the overwhelming majority of widowed parents were in receipt of Widowed Parent’s Allowance for more than two years – six months longer than the new Bereavement Support Payment runs. The data reveals that of 1,780 widowed parents 1,389 have been receiving Widowed Parent’s Allowance for two years or longer and 244 of them for 10 years or more. The longest claimant was 16 years. The chart below shows the significant difference in the amount of benefit widowed parents could receive if their husband/wife died before and after the April 6, 2017 reforms. 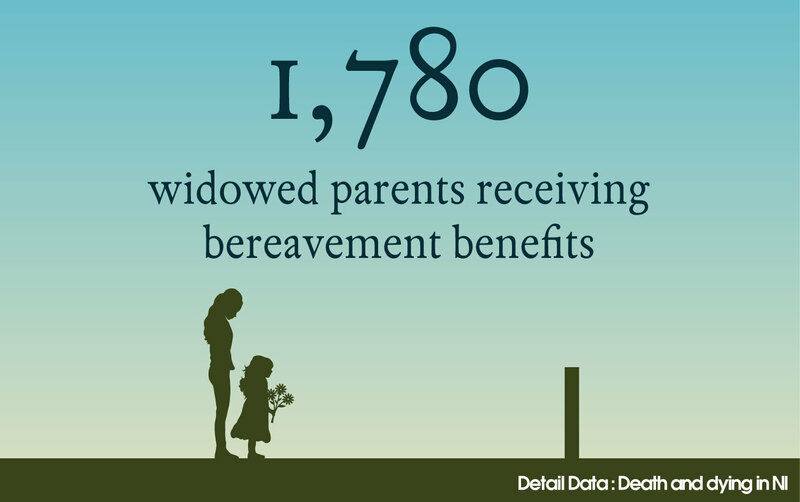 Within six months of the bereavement benefit reforms, 461 claims for the new Bereavement Support Payment had been made - 86 of them by widowed parents with dependent children, according to DfC figures. “The changes in bereavement support don’t reflect the need for families to be supported throughout the lifetime of their child,” stated Sarah McCully Russell, Citizen Advice Northern Ireland’s policy and information officer. An equality screening exercise of the new Bereavement Support Payments carried out by DFC admits grieving spouses with young children will be worse off in cash terms. However, DfC will not be carrying out a full equality impact assessment (EQIA) on the new policy. “While it is recognised that claimants of this benefit who have dependent children may receive the benefit for less time than under the old arrangements, this is in line with the intention of the bereavement support payment. “This is a benefit aimed at providing support in the period immediately after bereavement as opposed to an income replacement and accordingly the payment amounts are reflective of the additional support a family could need at such a time,” the screening form adds. The new Bereavement Support Payment has also come in for criticism as it is still only available to married couples or civil partners. Yet in Northern Ireland 43.5% of babies were born outside of marriage in 2016 – more than 10,000 children, according to the Northern Ireland Statistics and Research Agency. One mother-of-four who has suffered emotionally and financially as a result of that rule is Co Antrim woman Siobhan McLaughlin. Following the death of her partner of 23 years, John Adam, she was turned down by the state for bereavement benefits because the couple had never married. At the time of Mr Adam’s death in January 2014 his children were aged just 10, 12, 17 and 19. The grieving family have lost out on tens of thousands of pounds of bereavement benefits because they were unmarried including a £2,000 lump sum and a weekly benefit of up to £114. Ms McLaughlin recalled the immediate aftermath of the tragedy. “You are dealing with so much and you are just in a blinkered state. You know you have to deal with things but when it comes to it you’re just not functioning properly, you are not making any decisions. I was not quite capable of it. “It was hard, there’s no denying it,” she explained. “It still is hard. 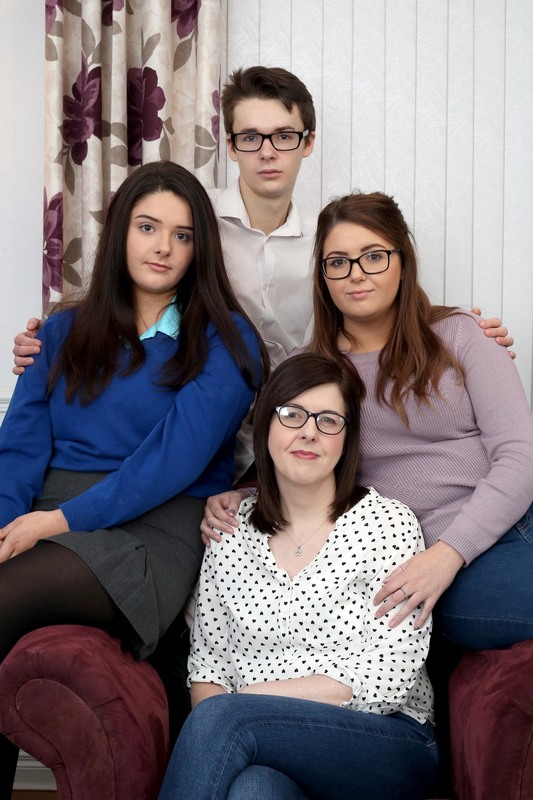 Her dire financial situation forced Siobhan to return to college just months after Mr Adam’s death to gain qualifications in an effort to secure employment. “They lost not only their dad but they also lost that family dynamic. I wasn’t there to make the dinner. It was another shift for them to adjust to at a time when they probably needed their mum most,” said Ms McLaughlin. “You would love to be with them but we live in a real world. You need money coming in. I went back to tech to finish qualifications within the first year of losing John and it really was a struggle. Many times I sat in the car park saying ‘I cannot go in there today’ but knowing I had to for the sake of them. And it was because of her children that Ms McLaughlin - with the backing of Citizen’s Advice - decided to take on the state in a major legal battle over its benefit ban decision. “You can have two 10-year-olds going through the same thing – both have lost their dad. Yet society has said to one of them because your parents were married you deserve this, and to the other one, you don’t. It makes them feel irrelevant. I felt I had to give it a shot,” said Ms McLaughlin. The landmark case is due to be heard by the Supreme Court, which will be sitting in Belfast for the first time, on April 30. Ms McLaughlin’s solicitor, Laura Banks from Francis Hanna & Co, told Detail Data: “If Ms McLaughlin’s case is successful, the criteria for these benefits should be opened up to families of co-habiting parents throughout Northern Ireland and the UK.